Last month I participated in a 10 day silent course at Vipassana Meditation Center in Jaipur, along with approximately 200 other students from around the world. Vipassana centers are located in many countries, seeking to teach aspirants the method that Buddha taught 2500 years ago in northeastern India. 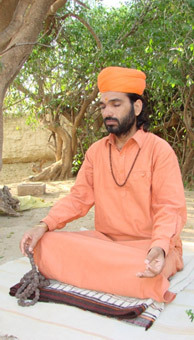 Meditation has been a part of my life since adolesence. Throughout my spiritual life I have encountered techniques in various awareness practices, Tantra, and yoga. I found the Vipassana method to be simple and spontaneous because of the deep immersion created in the closed environment and rigid schedule. It reassured my belief that meditation is really a subject of experience – we can’t explain it in words, which have tremendous limits. It is my personal experience that when a person possesses and expresses good merits such as love, truth, and compassion, the universal energies that govern this world volunteers its efforts in increasing these same merits. It is a cycle that improves the overall developmental momentum and positive direction of a person’s life. I believe that all siddhas, nature, and God give me blessings in the prasadem of my meditation practice; they reward me because daily I seek to experience my own true nature, and the points of my integration with the nature around me. Because of these blessings, I have observed that the false rhetoric, cheating, selfishness and manifestations of mental conflict that are always present in our societies, cannot affect me very deeply. Life is simple this way. Meditation is an opportunity to understand your mind at a deeper level than how you are accustomed to operating the rest of the day. With an accurate technique you will be able to distinguish between the conscious, subconscious, and unconscious minds, and the mechanisms each uses to make its presence known. These mechanisms, though usually protective, will expose supressed desires, conflicts, and obstacles that in your behavior can manifest as addictions, agressions, or revulsions. And when you understand the mind’s reflexes and survival strategies, you will find the remedies nearby. Nature is generous in this way – a poisonous plant is never far from the antidote to its infection. These revelations are not instant – it is a sliding scale of learning. While meditating our thought waves slow down and the mind begins to disappear. Time loses its importance. It is here in this space where the mental modifications become fewer. “Yoga chitta vritti nerodha.” Yoga is the absence of mental modifications, as Patanjali taught us through his sutras. A meditating person goes beyond suffering and mental conflict, where intellect and wisdom are controlled. This state is called sthith pragya, nirvana, or moksha. With meditation you become more calm which leads to more self knowledge, which in turn leads to more mental stability…and so your growth increases steadily each time you meditate. The Vipassana method was taken from the Buddha Dhamma records. And before that Lord Shiva’s 112 meditation techniques are recorded in the Tantra Sutras, from which almost all spiritual traditions developed their own systematic and scientific procedures. Shiva’s techniques reveal the psycho-physical connection through awareness, through which mental mechanisms, physcial sensations, and breathing, expose our body’s connection with the soul at a practical level, not just intellectual. However, to accomplish this, we must be consistant in practice with any type of meditation. “Bada bada soong na sadhiyo oh mastano mun.” Lalnath validated our struggle with meditation by saying ‘Only a few people will become enlightened’, the rest will succeed in just the pursuit. In other words, success in meditation is found in the journey, not the destination. That is why meditation is very important for you and all people, to be able to give yourself fully to your day to day life no matter your path – a good job, a good service, a good family. All will improve with consistent meditation.